I have to commend Bates Motel for directly referencing Alfred Hitchcock with the title of its latest episode. Shadow of a Doubt is not only one of Hitchcock’s finest films but it’s also one that shares quite a few themes in common with Bates Motel. Like Bates Motel, Shadow of a Doubt deals with the way an outwardly placid surface can hide all sorts of scary and dark secrets. At this point, it’s a lot easier to imagine Freddie Highmore’s blankly charming Norman growing up to be Joseph Cotten’s friendly murderer Uncle Charlie in Shadow of a Doubt than the twitchy character made famous by Anthony Perkins in Psycho. Still, it’s hard not to feel that an even better title for last Monday’s episode would have beenNorma Bates Sings. That was pretty much the highlight of last night’s episode and that’s not at all a complaint. The people behind the show obviously realize just how lucky they are to have Vera Farmiga playing the role of Norma Bates. The show works best when she’s allowed to take center stage and that’s what literally happens in Shadow of a Doubt. Norma was singing because she and Norman were both trying out for the town musical. I loved this subplot on so many levels. First off, it made perfect sense that Norma, who obviously believes that Norman killed Ms. Watson, would try to find an activity that she and Norman could do together. This, of course, both allows Norman to be occupied with something other than death and gives Norma an excuse to keep an eye on her possibly dangerous son. Secondly, and perhaps even more importantly, it seemed exactly like the type of thing that somebody like Norma Bates would get excited about. Being something of a community theater refugee myself, I couldn’t help but smile when I saw Norman and Norma at the auditions because it felt exactly right. Everything from Norman’s sullen attitude to Norma’s surprisingly heart-felt (yet endearingly awkward) audition rang true. 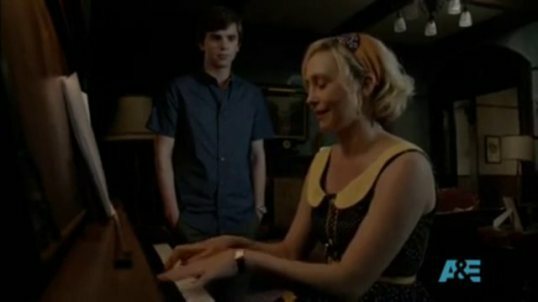 During those scenes,Bates Motel went from being that strange little show about a boy who might be murderer to being a very believable and almost touching story about a loving but overdramatic mother and her socially awkward son. As for the rest of Monday’s episode, I have to say that I was slightly relieved to see Bradley safely get on that bus and head off for a new life. It’s not so much that I thought Bradley wouldn’t make it as much as I was worried that I’d have to sit through several episodes of Bradley hiding in the basement and Dylan being forced to help search for Gil’s murderer. Don’t get me wrong. I think that Nicola Peltz’s performance as Bradley was underrated by a lot of critics and I also think that, as played by Max Thieriot, Dylan is one of the most intriguing characters on the show. It’s just that I felt that Bradley’s subplot was good for, at most, two episodes. Bates Motel wrapped it up in two episodes and good for them. The other big development is that Sheriff Romero arrested a drifter and charged him with Ms. Watson’s murder. We knew the guy didn’t do it. The drifter certainly knows he didn’t do it. And, for that matter, it’s pretty obvious that Romero knows that he’s got the wrong guy too. However, that is what makes Romero such an interesting character. He’s less concerned with solving crimes and enforcing order than he is with maintaining balance. It’s obvious that the entire town of White Pines Bay has found a balance between good and evil, legal and illegal and that balance works for them. Ms. Watson’s murder threw that balance off and Romero’s actions are more about resetting everything back to normal than anything else. So, all in all, Shadow of a Doubt was a pretty good episode of Bates Motel and hopefully, it’ll be a sign of things to come for season 2. My only complaint? So far, Emma, my favorite character, hasn’t gotten to do anything. Hopefully, that’ll change in the upcoming episodes. Personally, I can’t wait to find out!